This empirical paper is purposely written to be sim­ple and straight forward. It has two main goals. The first is to provide a descriptive analysis of the histori­cal patterns of growth, international trade, factor ac­cumulation and human capital in Cuba during the post-revolution period. The second is the estimation the rate of technical progress or total factor of pro­ductivity (TFP) in Cuba during the period 1963­1988, and to compare it with other world regions. The literature dealing with economic growth, tech­nological change and human capital is vast and grow­ing at a fast rate. It is widely known that the impor­tance of changes in TFP in explaining why some countries grow more rapidly than others, or why some specific industries of a country grow faster than others for a given period of time. But empirical esti­mations of TFP of centrally planned economies are rarely seen. This can be explained because of the lack of good and reliable data, which makes this type of research a lengthy if not unattainable task. As result of the lack of empirical studies relating growth and technological change, Cuba’s economic growth still challenges economists. Hence, many questions could be asked, such as: Is the increased per capita income in Cuba a consequence of better educated labor force, which could have led to a high rate of techno­logical change (TFP), or is it the result of increased investment resulting from Soviet subsidies? How much is the contribution of the different factors (labor, capital, TFP) to total Cuban economic growth and to the growth of some specific sectors of the Cu­ban economy? Is Cuba’s rate of technological change lower or higher than of capitalist economies? The re­search underlying this paper is directed to answer these questions. The paper is organized as follows. The first section provides a brief overview of the Cuban economy, in­cluding some macroeconomics indicators, productive structure, international trade, and human capital in­dicators. The intent of this section is to give some background of Cuba’s economy to have a better un­derstanding of Cuba’s initial economic conditions and its process of economic growth during the period 1960-1988. The second section contains a brief review of the literature dealing with economic growth, technological change and human capital. The third section is the core of the paper. It tries to explain growth and technological change in Cuba; techno­logical change is estimated using the traditional methodology to estimate TFP (Solow, 1957). The contribution of factors to Cuban economic growth is also estimated. The fourth section contains an econo­metric estimation of the economy of scale of the Cuban economy and of some economic sectors (agricul­ture and industry). The fifth section compares Cuban technological change with other world re­gions. The last section contains some conclusions. Cuba’s economic history is directly linked to agricul­tural production and its international trade is mainly related to sugar production. The revolution has had to constantly struggle with the need to diversify the economy and build an industrial base against the need to increase sugar production in order to accu­mulate capital required to industrialize and diversify the economy. By 1959, 80% of Cuba’s export reve­nues came from sugar. Although the Cuban revolu­tion has tried to carry out plans for agricultural diver­sification, industrialization and export diversifica­tion, it has not accomplished enough in these areas given that the Cuban economy is still highly depen­dent on sugar as much as thirty years ago. As will be shown below, the failure of the industrial­ization plans is reflected in the fact that the percent­age of Cuba’s total industrial production output as share of Gross Material Product (GMP) 2 has basical­ly remained the same over a twenty-five year period. On the other hand, construction‘s share has in­creased steadily and agriculture’s has decreased over the years. Despite its smallness, dependence on sugar monocul­ture, lack of natural resources and energy resources, Cuba sustained a good economic growth during the period 1960-1988. Cuba was able to grow at a steady annual rate of 4.4% during this period. Statistics show that during the period 1960-1988, per capita income increased at an average annual rate of 3.2%. Cuba increased considerably the rate of investment, which went from 15% of the national product in 1960 to 30% in 1988 (Table 1). Huge amounts of resources were invested in agriculture and education. Table 1 shows that the highest rate of economic growth was achieved when the investment rate was decreasing. It is apparent that between 1960 and 1964 there were no increases in per capita income. On the other hand, during the period 1964-1988 in­come per capita increased at a considerable rate. Note that Soviet subsidies rose considerably through time, reaching a higher share of national product than in­vestment for the period 1980-1984. In other words, it can be assumed that most of the Cuban investment during this period was realized by using Soviet subsi­dies. This clearly shows that the Cuban economy was losing saving capacity. Industrial and agricultural production are the main economic sectors in Cuba’s economy, accounting for more than 80% of the total GMP or about 60% of Gross Social Product (GSP). Table 2 shows the share of total GMP and their rate of growth for the period 1963-1988: agriculture’s share has been decreasing over time, while industry’s share has remained con­stant over the last 25 years. Cuba’s main exports are sugar and sugar derivatives (Table 3). These accounted, during the 1980’s, for approximately 77% of total exports. Recently, miner­al exports (mainly nickel) have replaced Cuba’s sec­ond chief export, tobacco. Tobacco exports account­ed for 10% of total exports in 1960, but for only 2% in 1987. The concentration of international trade on sugar ex­ports makes Cuba’s economic output extremely vul­nerable to world sugar prices, which have dramatical­ly fluctuated over the years. During the revolution, some stability was attained by Russian guaranteed fixed prices, which were often higher than world prices. With respect to Cuba’s imports, statistics show the degree of the nation’s dependency on imports. This dependence is clearly evident in a continuous trade balance deficit for more than 32 years. This constant international trade deficit contributed to Cuba’s reli­ance on Soviet financing. Following the so-called “end of the cold war,” with the disintegration of the Soviet Union, Cuba no longer receives Russian fi­nancing for the trade deficits. 4). Fuel imports increased considerably from 1960 to 1986, accounting for one third of total imports in re­cent years. Also note that the share of machinery and transportation equipment imports increased at a rate of more than 4% a year during the last 20 years. Cuba’s dependency on imported technology for ma­chinery and transportation equipment is clear. 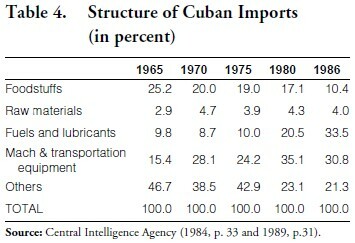 Table 4 shows the failure of the Cuban industrialization program adopted as the main goal of the government after 1959. Investing in human capital is a concept widely used by economists, which basically describes the process of improvement of the quality of the labor force. Thus, human capital is referred to as the level of edu­cation of the labor force. Improvement of the quality of the labor force is basically accomplished by educa­tion and training. Since there is no accurate data con­cerning the rate of change of education of the Cuban labor force, for purposes of discussion in this paper, it is assumed that human capital changes at the same rate than the enrollment rate change. Table 5 contains data of enrollment in Cuba between 1958 and 1985. With respect to education, Cuba considerably increased the rate of enrollment, thus increasing its human capital during this period. It is clear from Table 5 that human capital accumulation has been quite rapid. Hence it could be concluded that the Cuban government was successful in achiev­ing a high rate of improvement of human capital. Improvements in the educational attainment of the labor force, as happened in Cuba, should contribute positively to output through efficiency gains, which should be reflected in the rate of technical change or TFP. Thus, the important issue to be examined in this paper about human capital is how human capital improvement contributed to Cuban economic growth. The two crucial questions regarding human capital that we will try to answer in the coming sections are: How much did the educational effort con­tribute to economic growth under a centrally planned economy? Is there any economic return from the investment directed to improve Cuban hu­man capital during the period 1962-1988? Many theories have been developed by economist over the years to explain economic growth and devel­opment. These usually try to pinpoint what are the determining factors that contribute to growth and development. Old political economist such as Adam Smith and J.S. Mill considered education as an important factor for economic growth and development. But investment in human capital was for the most part ignored in discussions of economic growth until the mid-1950s. In the 1960s work by T.W. Schultz (1961, 1963), Denison (1962), Mincer (1958, 1962) and Becker (1964), began to focus more and more attention on the role of human capital in economic growth and technological change and to determine the returns from education and the proportion of the rate of growth of output due to investment in education. In 1980, the World Bank showed renewed interest in the development of human capital (Wheeler, 1980). The results of Wheeler’s comparison of 88 develop­ing nations suggested that education, health and nu­trition contributed to growth of output not only di­rectly, but also indirectly, by increasing the rate of investment and by lowering the birth rate. Wheeler also found that, on the average, an increase in the lit­eracy rate from 20 to 30% caused national income (GDP) to increase by 8 to 16%. The finding that general investment has less effect on growth rates when it is not supported by educational investment has been confirmed by studies carried out by Jamison and Lau (1982) and Psacharopoulus (1984). An empirical study by Mankiw, Romer and Weil (1992), using an augmented version of the So-low model (1956)—adding accumulation of human and physical capital—also found that the presence of human capital accumulation increases the impact of physical capital accumulation. Decades earlier, Schultz (1963) had also expressed puzzlement over a residual he was finding when measuring the increases in production over time and determined that the missing piece was the investment in human capital via education. The neoclassical growth model was mainly defined by Solow (1956). His model focuses on capital accu­mulation and the quality of labor for economic growth. But, Solow’s model had the shortcoming in that it did not explain the link between growth and technological change, which was seen as exogenous in his framework, which obviously could result from level of education of the work force among other fac­tors. The new endogenous growth theorists, starting with Paul Romer (1986) and Robert Lucas (1988), have tried to find the determinant factors that drive eco­nomic growth, such as human capital, new technolo­gies, economies of scale, and international trade. Much empirical work has been carried out lately to find out what factors are important for economic growth. Barro (1991) studied 98 countries for the period 1960-1985, concluding that faster growth is associated with a higher rate of investment by either private or government sector, a lower share in GDP of government consumption spending, higher school enrollment rates, greater political stability, and lower fertility rates. Capital, labor, human capital and technical progress are in general the four principal sources of growth of aggregate output. Based on extensive data collected for this study, the traditional methodology (Solow, 1957) will be applied to the Cuban case to have a better understanding of its economic growth. where Yt, Kt, and Lt are the quantities of aggregate real output, physical capital and labor, respectively, at time t, and t is an index of chronological time. The second equation (1’) is the traditional neoclassical growth model, which is a specific case of the first one. Since A varies with time and independently of K and L, technological change is by assumption disem­bodied, where a Hicks neutral technological change is assumed. This is the basic Solow (1957) model. 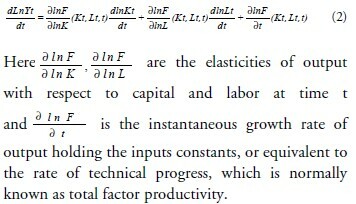 Note that the factor A(t) of equation (1’) represents the rate of technical progress, which may contain many elements such as: (1) capacity of people to cre­ate or to adopt new technologies; (2) capacity of the people to achieve a better way of combining means of production (Schumpeter’s view); (3) the efficiency of incentives or markets to innovate; (4) several possible forms of cost reduction (Harberger, 1990); (5) the efficiency of energy use; and (6) catch-up growth. For the above mentioned facts, it is important to un­derstand the determinants of TFP, especially when they are aggregated for the whole economy, and try to find an explanation to better understand this “black box” called A(t). Endogenous analysis of TFP has been a widely used technique to find the determi­nants and quantifying the facts that that generates technological change, such as, education, foreign trade and economy of scales. In general, technologi­cal change is considered to be mainly embodied in the labor, thus, it is assumed that education is the main determinant of technological progress. Hence, we have to keep in mind that when equations (2) or (4) are used to measure technical progress over time, three basic assumptions are implicit. In general constant return to scale are considered, together with neutrality of technical progress 3 and profit maximization with competitive output and factors markets. As we know, not every quantity on the right side of equations (2) or (4) can be measured directly. In fact only the growth rate of output, capital and labor are directly measured. Hence, the elasticity of output with respect to labor and capital must be estimated. This forces us to assume perfect competition, which implies that firms will set return on capital equal to marginal product of the capital, which implies that the elasticity of output with respect to capital (á) can be measured as the capital income in total output (GDP or GMP). Thus, the elasticity of output with respect to labor is considered as the labor share in to­tal aggregated output. Another alternative to using equation (1) to measure technical progress is the direct econometric estima­tion of the aggregate production function. Such di­rect estimation, does not require any assumption be­yond that of the functional form. 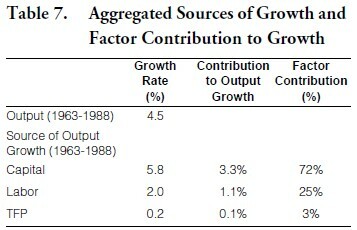 Where Y, δ are the rate of growth of output and the depreciation rate, respectively. This equation is used to estimate the stock of capital at the beginning of the period (1960). The following years stock of capital is basically the initial stock of capital plus gross investment minus depreciation. The stock of capital series was calibrated with the depreciation figures obtained from the Cuban national account statistics in conjunction with our estimates. The annual rate of depreciation considered for the whole economy and the industry sector was 4.5%, which corresponds to the average value of depreciation in similar income economies. Depreciation for agriculture was considered as 3.5%. Sensitivity analysis was conducted using a higher rate of depreciation (6%) to analyze how sensitive are the TFP estimates, without detecting much variation in the TFP obtained. The estimation of the factor shares of labor in total output was estimated from Cuba’s national accounts. 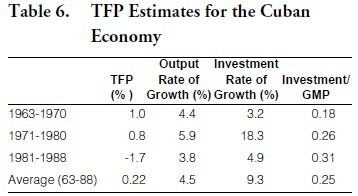 Using equation (4), the TFP in Table 6 were estimat­ed for the Cuban economy. Table 6 shows that pro­ductivity changes have been decreasing through time, achieving negative values after 1980. On the other hand the rate of investment increased considerably from 1963 to 1988. This results are contrary to what any economist would expect. Empirical applications to capitalist economies shows that increases in invest­ment and human capital and a lower rate of popula­tion growth leads to higher TFP. Hence, we would expect a higher TFP for Cuba, but we have found the opposite results. Table 7 shows that Cuban TFP contribution to eco­nomic growth is very low (only 3%). The contribu­tion of investment to economic growth is very high (75%). Hence, Cuba’s economic growth has been basically driven by increased investment, which is the result of the Soviet subsidies (Table 1). In other words, TFP results shows that Cuba was not able to take advantage of the investment in human capital to increase efficiency by cost reduction or productivity increase, specially during the 1980s. To better understand the previous results, a sectoral analysis of TFP was conducted. The sectoral results obtained are shown below. Table 8 shows that agri­cultural TFP has been negative for the period 1963 ­1988. Hence, there was complete technological stag­nation in the Cuban agricultural sector under the Cuban centrally planned economy. During this period, agricultural output growth was basically driven by increased investment. Note that the investment rate in the agricultural sector was much higher than in the industrial sector and the whole economy. Again, the only possible explanation is that agricul­tural output was the result of increased investment. It could be concluded that the negative agricultural TFP led to the widely known actual level of underde­velopment in agriculture (low yields and low level of productivity). In sum, the large amount of investment in the agricultural sector has been mainly wasted and Cuba’s agricultural sector has been consuming the stock of capital, without any productivity achievement. It seems an irony, because Cuba’s industrial development strategy was oriented toward getting resources from agriculture to develop an industrial base. But, reality shows that agriculture has been a big consumer of resources, without any positive result. While Cuba’s main exports are based on agricultural products, agriculture was not able to achieve any positive level of technological change. One possible explanation for this technological stag­nation is the lack of markets and economic incen­tives, which are impossible to be implemented in a centrally planned economy. In sum, it is possible to conclude that Cuban centrally planned agricultural economic policies were totally inefficient in their at­tempt to force some technological change during the period 1963-1988. Again, it can be concluded that Cuba was not able to take advantage of the invest­ment in human capital which could have led to an increase in TFP and eventually to an increase in agri­cultural output. Table 9 shows that TFP in the industrial sector was moderate for the period 1963-1980. But again, TFP was negative for the period 1981-1988. Looking at Table 2, it seems contradictory that at the same time imports of capital goods such as machinery and transportation equipment were increasing, TFP was decreasing. Table 9 shows that the ratio of invest­ment over output in the industrial sector was very low compared with the agricultural sector. This clearly shows that the right amount of investment, avoiding over investment, makes people more pro­ductive, achieving higher rates of technological change. Again, during the 1980s Cuba was not able to take advantage of the investment in human capital which could have led to an increase in TFP. 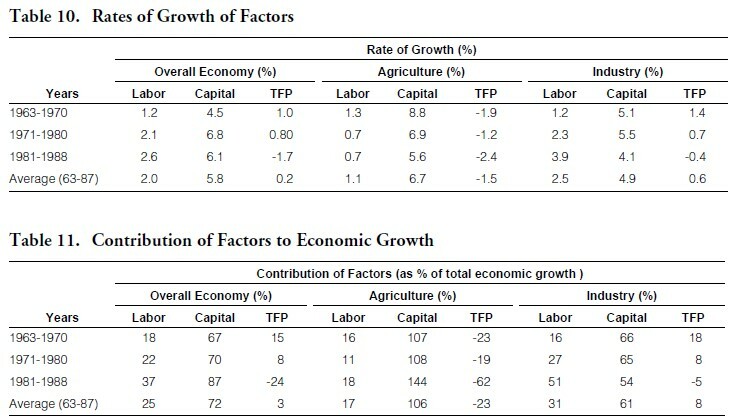 The rates of growth of the different factors and their contribution to economic growth can be seen in Ta­bles 10 and 11. Some could argue that the negative TFP during the 1970s and 1980s could be attribut­able to business cycles fluctuations. But in the case of Cuba this is not possible, since this period is consid­ered as the golden era of the Revolution due to the high rate of economic growth achieved. Moreover, during this period, Cuba was receiving the largest amount of subsidies from the Soviet Union, which isolated Cuba from world business cycles (see Table 1). Looking the results in Table 11, it is difficult to ex­plain why the massive investment in physical and hu­man capital led to low TFP in the seventies and eighties. One explanation could be the very well known Latin American proverb “escoba nueva barre bien” (a new broom always cleans well). In other words, during the first years of Castro’s regime, the vast majority of the population was excited about the revolution and communism. This initial excitement created high incentives for people to work hard and be productive and innovative, which could have led to the positive level of technological change observed during the 1960s. Then, as people tired of the re­gime, as the result of unfulfilled expectations and lack of gains from communism, they relaxed in their creativity and stopped working hard. Consequently, TFP decreased to negative levels. Estimating equation (7) with time series data for the period 1962-1988, yields the results in Table 12. Note that econometric estimation of equation (6) could lead to a multi collinearity problem (see Boskin and Lau, 1992; Harberger, 1996). Our data was test­ed for multi collinearity, without finding any prob­lem. Null hypothesis tests for CRTS were conducted, which led us to accept the hypothesis of existence of CRTS for the industrial sector and the Cuban econo­my as a whole. Results from Table 12 show that the elasticity of cap­ital (0.52) and of labor (0.54) to output for the over­all economy are close to the average value of factor share to total output considered in the previous sec­tion, which average 0.51 and 0.49. In sum, it can be concluded that the results previously obtained by using the indirect method are good estimates of TFP for the Cuban economy. Table 13 provides a comparative historical analysis of Cuba’s rate of technical progress during this period with respect to other regions. Estimates in Table 13 show that on average during the period 1963-1988, Cuba performed much worse than most of the capi­talist economies. 6 In sum, it seems that under a cen­trally planned economy, the rate of technological change (TFP) is significantly lower than in capitalist economies. Some general conclusions can be drawn from the above analysis. First, that the Cuban economy as a whole, as well as the industrial sector, exhibited constant return to scale during the period 1962-1988. Second, that the Cuban agricultural sector exhibited decreasing return to scale during the same period. Third, that TFP for the Cuban economy has been decreasing through time, turning negative during the 1980s. Fourth, that the average rate of change in technical progress (TFP) of the Cuban economy over the period 1963-1988 is very low (0.2%), this value being much lower than for most capitalist economies that were growing at rates similar to Cuba’s. Fifth, that the agricultural sector showed a very high nega­tive rate of technical change; thus, there was a com­plete technological stagnation in this sector. 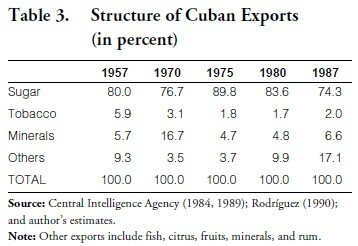 With respect to the agricultural sector it can be con­cluded that: (1) Cuban centrally planned economic policies were totally inefficient in promoting techno­logical change in agriculture; (2) human resources were used in an inefficient manner; and (3) there was over investment in agriculture, which possibly led to an even lower TFP. Our results show that Cuban government agricultural planning has been very poor and inefficient, a finding that has been validated by other studies (e.g., Mesa-Lago, 1981, pp. 24-25). Ac­cording to Mesa-Lago, this poor planning is the re­sult lack of manpower, its lack of knowledge and ex­pertise, and the lack of maintenance controls; for example, because of lack of maintenance controls, equipment breakdowns depleted the locomotive fleet by 50% (Mesa-Lago, 1981, p. 26). Obviously all these facts are reflected in the negative TFP estimated in the present study. With respect to the industrial sector, it can be con­cluded that the change in TFP has also been decreas­ing, but in this case the average value for the period of 1962-1988 is positive (0.6). The gains in produc­tivity during the 1960s could be considered reason­able, but again TFP is negative during the 1980s. It seems ironic that the largest lack of capital was in this sector, which was able to achieve a moderate level of technological change during the period 1962-1988. These research results clearly show that Cuba’s growth during 1963-1988 was basically the result of capital accumulation rather than from productivity gains. Moreover, considering the large amount of So­viet subsidies given to Cuba during the 1970s and 1980s, at first glance one might conclude that Soviet dependency created inefficiency, because during this period of lack of capital (lower level of investment), technical progress was higher. Cuba’s experience is contrary to capitalist economies, where an increase of physical and human capital create increases in tech­nological change. Cuba’s special case could be par­tially explained by the lack of economic incentives to innovate and by a centrally planned investment poli­cy which was totally inefficient in allocating resourc­es. The main conclusion from this empirical analysis is that Cuba’s development strategy has been a complete failure. The progress in Cuba was much like Russian growth in the past—it was obtained by mas­sive, often wasteful, capital accumulation rather than by productivity growth. In other words, the Cuban centrally planned development strategy has con­sumed large sums of the capital received through So­viet subsidies; these subsidies have been mostly wast­ed, without any improvement in technological change. Hence, it could be concluded that the main problem with a centrally planned economy is the lack of the right economic incentives and price systems. The lack of these elements do not allow for technical progress, leaving centrally planned economies behind those of capitalist countries. capital which has not been very productive under the Cuban centrally planned system. TFP estimates for Cuba compared to other countries (Table 13) show that if Cuba maintains a centrally planned economy, it will have a very difficult time catching up with the rest of the world. To correct this path, Cuba should consider some policies that make use of the markets and economic incentives to encourage technological change. Many important topics were not considered in this paper, such as a the role of the public sector through its actions and its expenditures in the process of tech­nological change. Finally, additional research is need­ed linking Cuba’s international trade and public pol­icy with technological change, in order to arrive at a better understanding and quantification of the deter­minants of the low level of Cuban technological change and their effects. Barro, Robert, J. “Economic Growth in a Cross Sec­tion of Countries,” Quarterly Journal of Econom­ics (May 1991), 407-444. Barro, R., and X. Sali-i-Martin. “Convergence Across States and Regions,” Brookings Papers on Eco­nomic Activity (1991). Becker, G.S. Human Capital. New York: Columbia University Press, 1964. Boskin, B., and L. Lawrence. “Capital, Technology and Economic Growth.” In Landau, Ralph, Nathan Rosemberg and David Mowery, Tech­nology and the Wealth of the Nations. Stanford: Stanford University Press, 1992. Brundenius, Claes. Revolutionary Cuba: The Chal­lenge of Economic Growth With Equity. Boulder: Westview Press, 1984. Central Intelligence Agency. The Cuban Economy: A Statistical Review. Washington, 1984, 1989. Denison, E. “United States Economic Growth,” Journal of Business, 35 (1992), 357-394. Denison, E. Trends in American Economic Growth, 1929-1982 .Washington: Brookings Institution, 1985. Domínguez, Jorge. Cuba: Order and Revolution. Cambridge: The Belknap Press of the Harvard University Press, 1978. Elias, Victor. “The Role of Total Productivity in Economic Growth.” In Special Issue on Eco­nomic Growth, Universidad de Chile, Departa-mento de Economía, Santiago, Chile, 1993. Fischer, Stanley. “Growth, Macroeconomics and De­velopment.” In Olivier Blanchard and Stanley Fischer, eds., Macroeconomics Annual 1991. Cambridge: MIT Press, 1991, 329-379. Grossman, G. and H. El Hanan. Innovations and Growth in the Global Economy. Cambridge: MIT Press, 1993. Harberger, A.. Project Evaluation. Chicago: Universi­ty of Chicago Press, 1976. Harberger, A. Reflections on the Growth Process, UCLA manuscript, 1990. Harberger, A. Reflections on Economic Growth in Asia and the Pacific, UCLA manuscript, August 1996. Hofman, Andre. “Chile’s Economic Performance in the 20th Century: A Comparative Perspective.” In Special Issue on Economic Growth, Univer-sidad de Chile, Departamento de Economía, Santiago, Chile, 1993. Jiménez, Georgina. Hablemos de Educación: Recopila-ción de Artículos, Comentarios y Reportajes sobre Educación. La Habana: Editorial Pueblo y Educación, 1985. Jorgenson, Dale W. and Z. Griliches. “Issues in Growth Accounting: A Reply to F. Denison,” Survey of Current Business, 52:5, Part II (1972), 65-94. Jorgenson, Dale W., Frank M. Gollop, and Barbara M. Fraumeni. Productivity and U.S. Economic Growth. Cambridge: Harvard University Press, 1987. Kim, J.I., and Lawrence Lau. “Economic Growth of the East Asian Newly Industrializing Countries,” Journal of the Japanese and International Econo­mies (1995), 235-271. Krugman, Paul. “The Myth of Asia’s Miracle,” For­eign Affairs (Nov/Dec 1994), 62-78. Landau, Ralph, Nathan Rosemberg and David Mowery. Technology and the Wealth of the Na­tions. Stanford: Stanford University Press, 1992. Lau, L. and Jong-Il Kim. The Sources of Economic Growth of the Newly Industrializing Countries on the Pacific Rim. Stanford University: Center for Economic Policy Research #295, 1992. Levine, R. and D. Renelt. “A Sensitivity Analysis of Cross-Country Growth Regressions,” American Economic Review, 82:4 (September 1992), 942­963. Lucas, Robert. “On the Mechanics of Economic De­velopment,” Journal of Monetary Economics 22 (1988), 3-42. Mankiw, G., D. Romer, and D. Weil. “A Contribu­tion to the Empirics of Economic Growth,” Quarterly Journal of Economics 57:2 (May 1992), 407-43. Mesa-Lago, C. The Economy of Socialist Cuba: A Two Decade Appraisal. Albuquerque: University of New Mexico Press, 1981. Mesa-Lago, C. “Cuba’s Economic Counter-Reform: Causes, Policies and Effects. In Cuba After Thirty Years: Rectification and the Revolution, ed. by Ri­chard Gillespie. London: Frank Cass Company Ltd., 1990. Mesa-Lago, C. and J. Pérez-López. A Study of Cuba’s Material Product System, Its Conversion to the Sys­tem of National Accounts, and Estimation of Gross Domestic Product per Capita and Growth Rates. World Bank Staff Working Papers No. 770. Washington: World Bank, 1985. Mincer, Jacob. “Investment in Human Capital and Personal Income Distribution,” Journal of Politi-cal Economy (August 1958). Mincer, Jacob. “On-the-job Training: Costs, Re­turns and Some Implications,” Journal of Politi­cal Economy 70:5 (October 1962). Pérez-López, Jorge. Measuring Cuban Economic Per­formance. Austin: University of Texas Press, 1987. Psacharopoulus, G. Returns on Education. San Fran­cisco: Jossy Bass-Elsevier, 1973. Psacharopoulus, G. “The Contribution of Education to Economic Growth.” In International Compar­isons of Productivity and Causes of Slowdown, ed­ited by J.W. Kendrick. Cambridge: Ballinger Press, 1984. Rodríguez, José Luis. Estrategia del Desarrollo de Cu­ba. La Habana: Editorial de Ciencias Sociales, 1990. Romer, Paul. “Human Capital and Growth: Theory and Evidence.” NBER Working Paper #3173, 1989. Romer, Paul. “Endogenous Technical Change,” Journal of Political Economy 98 (1990), 71-102. Schultz, T. W. “Investing in Human Capital,” Amer­ican Economic Review (March 1961). Schultz, T. W. “Education Investment and Return.” In Handbook of Development Economics, Chapter 13, H. Chenery and T.N. Srinivasan, eds. New York: North Holland, 1988. Solow, Robert M. “A Contribution to the Theory of Economic Growth,” Quarterly Journal of Eco­nomics, 70 (1956), 65-94. Solow, Robert M. “Technical Change and the Aggre­gate Production Function,” Review of Economics and Statistics, 39 (1957), 312-320. Solow, Robert M. “Investment and Technical Progress.” In Mathematical Methods in the Social Sciences, Kenneth J. Arrow, Samuel Karbin and Patrick Suppes, eds. Stanford: Stanford Universi­ty Press, 1960. Wheeler, D. “Human Resource Development and Economic Growth in LDC’s: A Simulation Model,” World Bank Staff Working Paper No 407. Washington: World Bank, 1980. Young, A. “A Tale of Two Cities: Factor Accumula­tion and Technical Change in Hong Kong and Singapore.” In Macroeconomics Annual 1992. Cambridge: MIT Press, 1992. Young, A. “The Tyranny of Numbers: Confronting the Statistical Realities of the East Asian Growth Experience,” Quarterly Journal of Economics (Au­gust 1995), 641-680. Zimbalist, Andrew and Claes Brundenius. The Cu­ban Economy: Measurement and Analysis of Social-ist Performance. Baltimore: The Johns Hopkins University Press, 1989.